Fulfilling the commercial objectives set by its preceding film, Iron Man 2 makes good on its aim to spearhead an entire Marvel Universe of film franchises. But at what cost? All of the goodwill engendered by its endearingly brash predecessor completely evaporates before this film reaches its denouement. Iron Man 2 doesn't play within any established dramatic constructs in existence. And it betrays the fine character work of its cast by limiting their appearances in order to tease fanboys with the promise of future entries in the tapestry it is intent on weaving. In the comic book market, Marvel achieved dominance soon after its inception in two innovative ways: it placed super-powered characters within a realistic context where they encountered topical issues; and it successfully established a shared universe where one comic book lead character could run into another from a different book. This reached its apex in The Avengers, a book about a team made up of Marvel's heavy-hitters, Iron Man, Captain America, Thor and the Hulk. In The Avengers, each character would banter, squabble, and eventually forge a partnership to battle a common enemy. What made this more fun for readers was the anticipation of knowing how one character might rub the other the wrong way based on what was known of the personal history established in each of their respective books. You could guess, for instance, that field soldier Captain America would approach a battle in a way that would lead to conflict with the weaponized rich boy Tony Stark, who was accustomed to fighting villains from a comfortable remove. These tensions create drama. 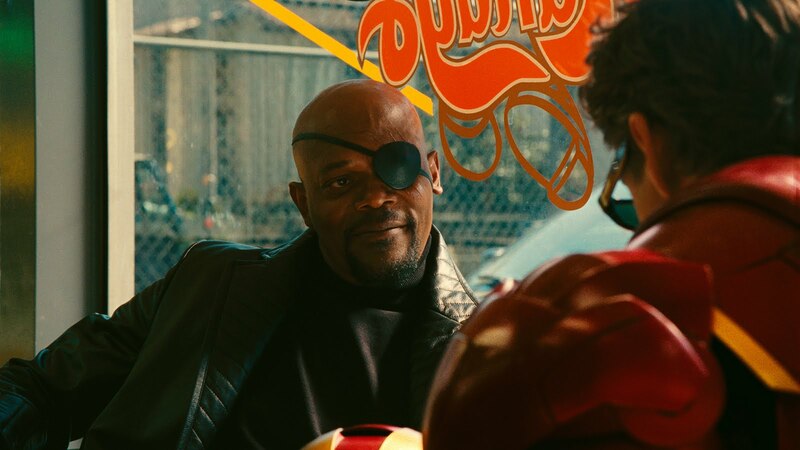 But the filmmakers behind Iron Man 2 are so excited to get to the superhero team-ups, they are sacrificing the character work necessary to sustain these antagonisms. In this respect, it is Iron Man 2's first half which is so full of unexecuted potential. 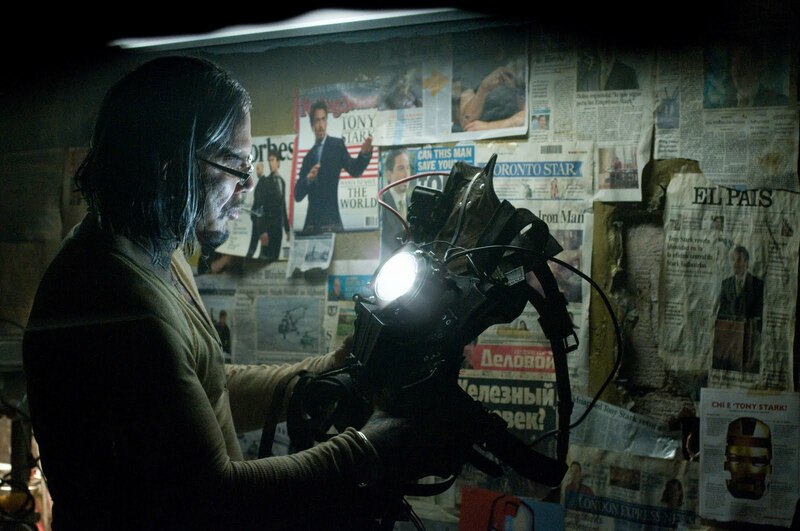 Ivan Vanko (Mickey Rourke) is introduced as an intriguing villain on the surface, one with a personal connection to Tony Stark (Robert Downey Jr.). A Russian physicist, his gold-toothed grin and the prison tattoos covering his steroid-enlarged body hint at an intriguing backstory for this greasemonkey counterpoint to the indulgent Stark. Likewise, Stark's reptilian business rival, Justin Hammer (Sam Rockwell), is the cheap knockoff antithesis of the far more polished Stark, who in this film is beginning to lose some of his luster. Riding the crest of celebrity since his admission that he is the armored superhero, Stark is enjoying whatever time he has left as he fights a fatal disease associated with the mini-reactor he must wear. To relieve the stress, the flighty billionaire also takes to drink, an issue which finally pushes away both his friend Rhodey (Don Cheadle) and paramour Pepper (Gwyneth Paltrow) when he drunkenly endangers the lives of partygoers at his birthday bash with wildboy antics in his powerful suit. There's a lot of fodder here for what could be an interesting deconstruction of a Howard Hughes-type (he has a problem with people actually touching his hands) control freak given the ultimate method of asserting such control and failing to be up to the task. Fascinating, too, would be a look at a superhero who doesn't hide his identity but instead selfishly capitalizes on it. Or the alcoholic hero who begins to get addicted after what initially started as just one drink to take the edge off. Many if not all of these storylines have been explored in greater depth in of all places, the Iron Man comic books read by kids (of all ages). But the 2-hour, three-act structure is not an epic enough forum in which to explore the multitude of setups that make this movie so top-heavy. And Iron Man 2 is so busy setting the table for subsequent installments, it neglects to follow through on the dramatic premises it sets up. All of which is to say that the film's second half degenerates into one ugly mess of superheroic proportions. If all one wants out of this film is an inordinate amount of time spent watching Robert Downey Jr. "kicking bots and taking names," as critic Stephen Whitty put it, then there's more of that here than he gives the film credit for in his review. The last third of the film is so crowded with CGI-generated robots and armored heroes it looks more like a video game than a film. But one can see from where his disappointment stems. With only a superficial exploration of the dramatic ruptures it has laid as its foundation, the film's climactic battle royale is rendered unsurprisingly inert. One gets about as much of a thrill watching it as one does from one of those Rock'Em Sock'Em Robots games. Furthermore, as if the earlier paragraph of story points isn't dense enough, there is yet another plot strand (begun in a post-credit scene in the previous movie) introduced which takes up even more precious screen time. Samuel L. Jackson returns as Nick Fury, head of Marvel's espionage organization S.H.I.E.L.D., to recruit Stark into the Avengers initiative, a subplot that won't be resolved until The Avengers film is released in 2012. Scarlett Johansson plays one of Fury's spies who has a connection to this initiative. 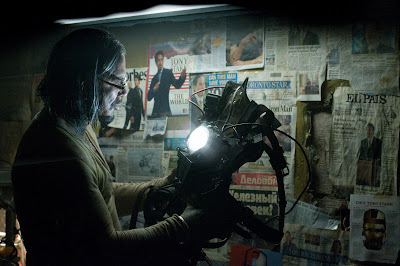 And Cheadle (replacing the first film's Terrence Howard) even gets in on the act, suiting up in some armor of his own, all the better to join the Avengers in their upcoming adventures. All of these irrelevant histrionics only serve to steal moments one could be spending with Rourke's captivating baddie, whose time onscreen probably amounts to little more than 15 minutes. Another post-credit scene rears its head in this film, as if to confirm where the filmmakers minds really lie. 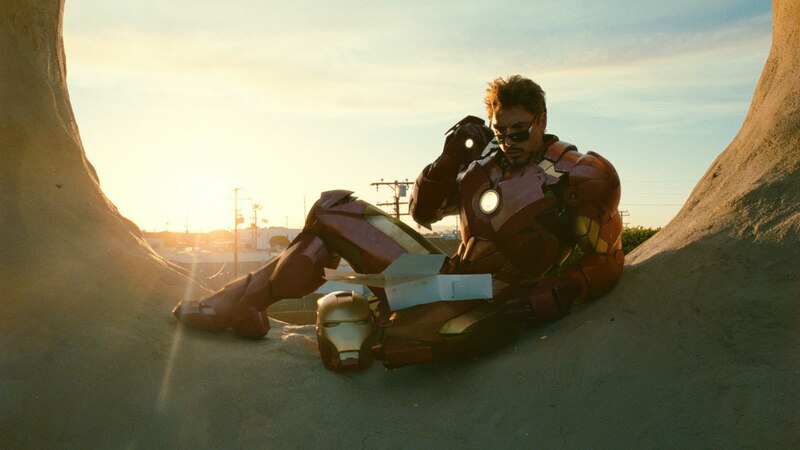 Geeks may be licking their chops to see all of the superheroes they adore make their first appearance in Iron Man 2. But if their debut amounts to nothing more than hollow extended cameos, what's the point?